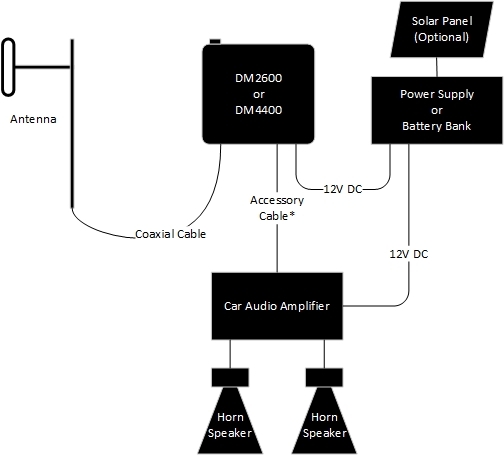 Using a DM4400 (or DM2600); a Car Audio Amplifier; Horn Speakers and 12V Power Supply, it's possible to create a Public Address system that uses two-way radio to make announcements. With the addition of solar panels, it's also possible to have the setup run completely independently of the AC mains. In principle, any mobile radio can be used however, it must support some means of selective addressing and ideally some form of activity output. In MOTOTRBO this is quite easy to do: simply make a private call to this radio, or if you have multiple PA setups like this, make all the radios a member of the same Talkgroup. The accessory cable will be used to carry received audio to the Car Audio Amplifier. To save power, the Car Audio Amplifier can be turned off while the system is idle. To do this, an output from the DM4400 called PL/Talkgroup Detect can be used to control the Car Audio Amplifier. Most (if not all) Car Audio Amplifiers have a remote input that switches the amplifier output stage on or off - some amplifiers don't require a very high drive current so the DM4400 should be okay to drive this input. I'll publish the pinouts shortly but they are shown in the Installation Manual and this can be easily figured out. You should use shielded cable since the audio levels will be low. NB. Be careful about using the speaker output - this is bridged mode and neither + nor - can be grounded. Also the speaker output is low impedance and high level which means it would have to go into a seperate input on the Car Audio Amplifier. The Car Audio Amplifier is just a regular amplifier the younger folk like to put in their cars for that extra umpf-stsk-umpf-stsk-umpf-stsk. If you don't need the PA setup to be that loud, you could take out the Car Audio Amplifier and just use the radio's speaker output (which is <5W). The Power Supply delivers 12V DC to the radio and amplifier - and optionally manages the solar panels and batteries. The antenna is just a regular folded dipole, or any antenna that works. Everything should be mounted in a weatherproof cabinet and this could all be mounted on top of a pole or mast. To use it, the dispatcher would simply need to make a private call to this radio ot a talkgroup call to all PA radios. Be careful about All Call - this makea avoice call to all radios. Be careful not to give access to radio users (I'll tell you a funny story about a supermarket PA system if/when I see you). Also be careful about where the dispatcher and PA speakers are - the wrong placement could cause audio feedback. You could use Telemetry to trigger a siren - you just need to add a siren (and, if needed) a circuit to control it. You could use Radio Check and Acknowledged Private Call to be sure the announcement goes out. Where can I download the MOTOTRBO CPS? The postings on this site are my own and do not necessarily represent the positions, strategies, or opinions of my employer, Motorola Solutions.